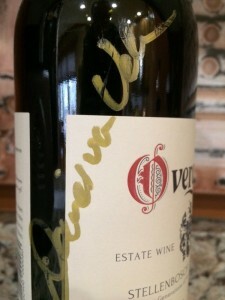 I had the opportunity to personally meet fourth generation owner and winemaker David van Velden of Overgaauw Estate last fall. Chris and I were invited to a private tasting at our friends home who represent and import fine wines from South Africa. We tried many of Davids wine and all are great. The following day David hosted a wine dinner at the Pour Wine Bar and Bistro in Otsego. We joined the wine dinner and enjoyed the food and wine pairings. As the evening progressed David and continued to talk about winemaking. He was bringing back a couple of cases of California wines to try at home. David was not familiar with a Wine Check so I offered to give him one to help with his travels. Months later via an email conversation he thanked me and said the bag really helped him. He also invited me to help during the 2016 harvest in February. Chris and I plan on going and I cannot wait! Moderate, young-fruity with aromas of current, spice, dark fruit and cocoa. Dry, full-bodied with balanced acidity. Medium with slight astringent tannins. 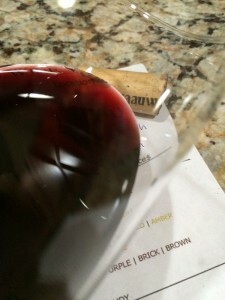 rich mid-palate flavors with a long lingering finish. How much: $25.00 The price for the wine is excellent! This is easily at $50+ Napa Cabernet Sauvignon. Composition: 100% Estate Cabernet Sauvignon. 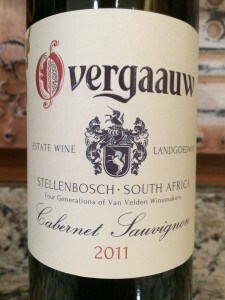 I rated the 2011 Overgaauw Cabernet Sauvignon four glasses.